CR3, CR4 are Control registers on x86 processors that are used configure and manage protected-mode functionality. These instructions may only be executed at CPL(Current Privilege) == 0 . i.e. in Kernel Mode. In the x86, linear addresses are translated by the TLB into Physical addresses (assuming Page Table Walks have been done prior to look up etc). A Cr3 load switches out Page Tables. In the Linux Kernel, it is executed during scheduling new process at context switch time (context_switch). Before the days of the PCID (see below), a load of CR3 flushed the TLB. Avoiding TLB flushes on Loads of CR3 are key to avoiding performace hits on context switches. In other words, a processor really needs to facilitate the storage of multiple address spaces in the TLB across context switches. Process-context identifiers (PCIDs) are a facility in x86 processors by which a logical processor may cache information for multiple linear-address spaces in the TLB. 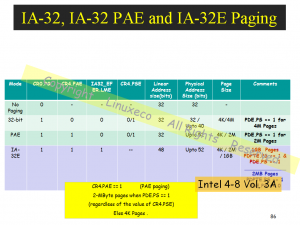 The processor may retain cached information when software switches to a different linear-address space with a different PCID e.g., by loading CR3. i.e. A PCID is a 12-bit identifier, and be thought of as a “Process-ID” for TLBs. If CR4.PCIDE = 0 (but 17 of CR4), the current PCID is always 000H; otherwise, the current PCID is the value of bits 11:0 of CR3. Non-zero PCIDs are enabled by setting the PCIDE flag (bit 17 of CR4). Rules do apply on enabling PCID on x86 processors. Caveats emptor. Naturally, restrictions on the operating system may apply to take advantage of this mechanism. Context switches that require isolation of Linear addresses between processes must be done with care. And/or linear addresses between processes with PCID‘s enabled may overlap, and so will translations of Linear Addresses to Physical memory ! Ouch. More on the implications of this for Linux will follow.